Your heart chakra is the spiritual center of your entire chakra system, it’s also the portal through which you can connect with your soul light, and the love and guidance of the angelic realm. Th heart chakra is located in the exact middle of the seven major chakras within your psychic body; three above, three below. The lower three (root, sacral, and solar plexus) are connected to your physical body and the material world. The upper three (throat, third eye, and crown) are connected to your emotional body and the spirit world. The beautiful function of the heart chakra is to connect upper and lower in balance and harmony. As the spiritual center of the chakra system, its keywords or themes include healing, compassion, relationships, connection, and love. 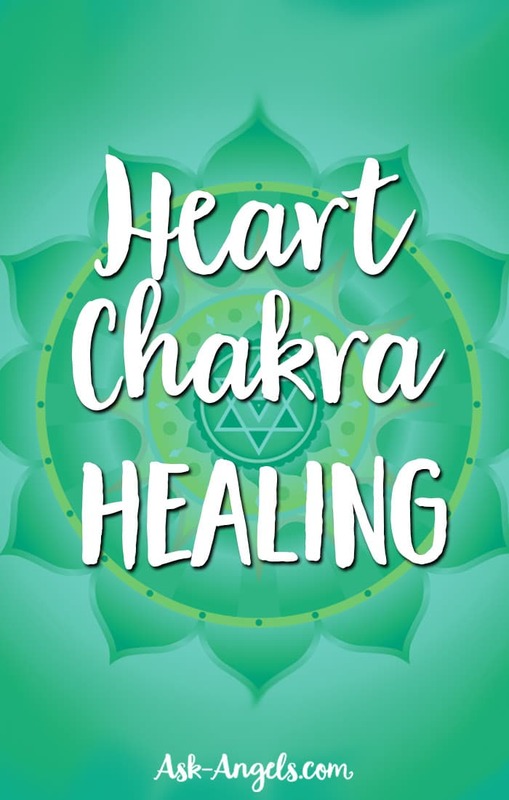 The heart chakra is connected to healing on all levels (emotional, mental, physical), your ability to love freely and openly, and your ability to properly process your emotions. If you regularly experience problematic or draining relationships, or find you have a difficult time connecting to people in a meaningful way, then it’s possible that your heart chakra is blocked. If you struggle with forgiveness (of yourself or others), if you have an emotional wound that never seems to heal, if you’ve gone through a recent break-up or other hardship, or if you regularly feel lonely despite having caring people in your life, these are signs of a blocked heart chakra. Other signs of blockage include shyness, lack of empathy, codependency, needing validation for fulfillment, jealousy, judgement, low self-esteem, being critical or controlling, suspiciousness, feeling possessive, being afraid to let go of emotional hurt, defensiveness, and distrust. You have a tendency toward insincerity and expecting to be rewarded for giving love. If you fear a loss of independence if you give love, or a fear of commitment, or a constant guarding against being hurt in love, these are clear signs that you are leading less with your heart and more with your mind. The counter to this is a healthy heart chakra – which is essential for spiritual growth, and progress on your ascension path. Not only are your relationships supported on the physical plain, but an open heart chakra moves you toward the understanding that you are not separate from the parts of you (physical, emotional, spiritual), or the Divine. If you are usually compassionate, feel emotionally fulfilled, and enjoy loving deeply, these are signs of a healthy heart chakra. You easily maintain intimate relationships but also have healthy personal boundaries. You are trusting, forgiving, nonjudgmental, kind, and often radiate a peace and calmness that others perceive (if only unconsciously!). You have a strong connection with nature, you get along with most members of your family, you’re reliable, people find themselves opening up to you, and you feel a sincere gratitude for everything that enters your life – even the challenging things. It is here that your energy begins to shift toward the spirit realm. Opening this chakra not only helps you to dissolve the myth of separation, but it awakens you to the universal love surrounding and filling you. 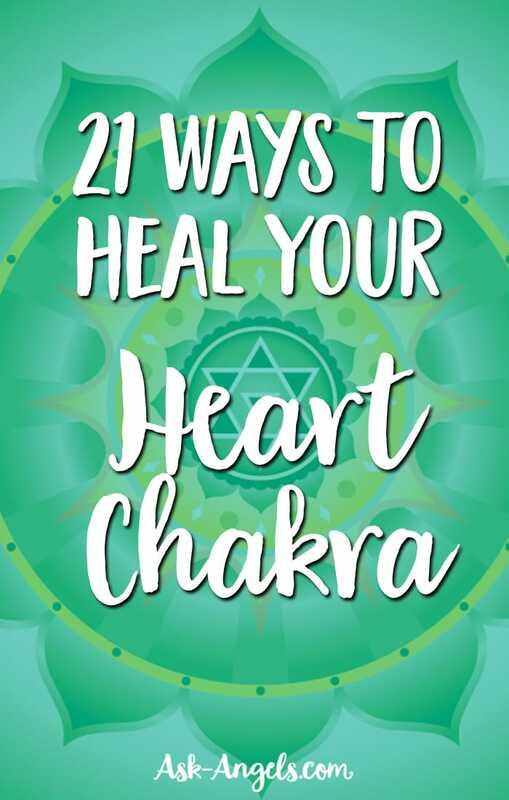 Here are 21 ways to bring heart chakra healing into your life now. Simply put, give love. Find a way to express your love of the people in your life. Whether it’s with a physical touch, words of gratitude, or some other means that feels good to you. Be open to your emotions. Whether you scream into a pillow, have a long heart to heart with a friend, or write them in a journal. Be honest and let your emotions out. Holding them in, or worse, repressing them, leads to more pain than verbalizing them in a safe environment. Practice acceptance. His Holiness the Fourteenth Dalai Lama expressed it best, ‘If it can be remedied, why feel unhappy? If it can't be, why worry at all?’ Acceptance of life as it is, as it is happening, is a powerful spiritual tool. Work on letting go of those things that no longer serve you. This can be scary and requires some dedication and focus, but letting go of what you don’t need frees up space for the Divine to move in. Practice asanas that open your heart. These include eagle, camel, wheel, and any back bends. Use the bija mantra, ‘YAM,’ associated with the heart chakra. Repeat it to yourself any time you feel you are closing down. The color associated with the fourth chakra is green. Get out in nature, and let the green vibration fill you and heal you. Visualize a deep green light filling your heart center. You can even visualize the wheel or sphere of the chakra freely rotating in a sea of green light. Hold the visualization for 5-10 minutes. Express gratitude whenever you can. Practice loving yourself. Take note of harsh thoughts and feelings that your mind directs at you. Notice them, acknowledge them, and then let them go. You can build up to replacing them with kind and loving thoughts and feelings. Practice forgiveness. If you are holding on to past hurts, acknowledge that now is the time to release them. This may mean that you seek professional counseling or that you go deep within to touch and hold the wounded parts of you. Whatever approach you use, remember that letting go paves the way for new growth and opportunities. Make a list of everyone in your life who has loved you. Commit to a random act of kindness every day for one week. Reconnect with an old friend and tell him or her what they meant to you. Sing, hum, or chant. It doesn’t matter where or what, just be sure to sing with your authentic self. Practice listening to others. Spend five minutes being completely present for someone else. Don’t worry about giving advice, just bring your whole self to the experience. Use essential oils like geranium, rose, or bergamot. Use them in an infuser in your home or work space, or dab some on your pulse points. Meditate on your heart center. Imagine each inhale and exhale as a green color and imagine the color spreading throughout your entire body as you breathe. Imagine this green breath removing negativity from your heart as you exhale. Practice self-care on a regular basis. Whether it’s paying attention to and pampering your physical self or taking a day of rest, focus on you and give yourself love in many different ways. Balance Your Entire Energy Body? When one chakra is out of balance it's usually a sign that your entire energetic being could use some cleansing and balancing, because all your chakras work together! For a complete chakra balancing meditation, click here! What’s a Healing Crisis – Are You Having One?